Just wondering why helicopters in Hawaii use the runway at Hilo like an aircraft, then taxi 3 feet off the ground to the helipads. Even on the Kona side, the helicopters land along a “runway” and then taxi to the hard stand. But they take off straight up. It seems that taxiing such long distances at such close proximity to the ground would add risk. Police, fire and ambulance helicopters around SoCal don’t do all that taxiing, so is it a Hawaii thing? A charter ops thing? It’s safer to have airspeed (rather than straight up/down) so the pilot can autorotate in case of engine failure at lower altitudes. So I would assume that it is for risk mitigation. I've seen the same thing in the military. Blackhawks and Apaches taxiing to and from runways for take off and landing. I saw the same thing at PDK in Atlanta and at SPG and CLW here in Saint Petersburg. Always thought it was weird too. Never quite understood why. It’s particularly a bit unnerving taxing parallel to a runway where the helicopter is using to “taxi” himself because unlike the plane on the ground, it could just “veer off”. As a KOA helicopter pilot I take issue with "straight up". We normally use "closed Bravo 2" for takeoff runs. Taxi A if no traffic. A helicopter needs to achieve a certain forward speed for a normal takeoff, therefor accelerating along a taxiway/runway. Like slab wing aircraft it is safer to do this above a smooth surface. Lacking wheels, air taxi is the only way to move. Helicopters are assigned a height/speed envelope, within which is "dead man's curve." 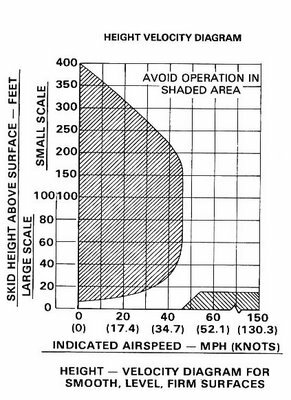 The height-velocity envelope includes an area within which a power loss to the main rotor will not have insufficient altitude to effect an autorotation. You can think of autorotation as an airflow reversal through the rotor disc. During powered operations, airflow is downward from the rotor. When the rotor is freewheeling (eg, autorotation, what helicopters must do after a power loss), airflow from under the rotor disc keeps the rotor turning and provides lift. When a power loss occurs , the helicopter will start down fairly quickly. The pilot must lower the collective and disengage the rotor. The lowering of the collective flattens the rotor bladepitch, decreasing angle of attack, and reducing drag on the rotor, allowing the rotor to transition to autorotation, being driven by the slipstream from under the helicopter as it descends. Altitude loss occurs between powered flight and autorotation. If the aircraft is at an insufficient altitude to make that transition, it won't be able to achieve autorotation, and any use of the collective to arrest the descent will only result in rotor RPM decay and ultimately total loss of lift and control. It's within that range, the "dead man's curve," in which if you lose power, you're potentially dead. Keeping the helicopter within a height/speed envelope in which energy can be converted and used, is a wise practice. It's not always possible in helicopter operations, but pulling collective straight up and descending straight down can present a number of hazards both the the helicopter and to other aircraft. When descending into the helispot, it's well to remember other aircraft operating in the area; vortices remain in the area of the approach path, and can affect aircraft below, as well as taxiing, parked, or flying through the rotorwash. Approaches to taxiways or runways may be conducted to keep traffic flowing, and air taxi (or hover taxi) conducted to prevent the helicopter overflying taxiways, hangars, parked or taxiing aircraft, etc, as well as reduce rotorwash, blown debris, etc; an air taxi over paved surfaces minimizes foreign object damage to other aircraft, brownout when approaching over dirt, etc. Hover checks before flight and after a flight are a wise practice before taking the helicopter out of ground effect, and after returning. I have wondered about this myself for years. Your responses to the TA's post make perfect sense. One question, though. Do(es) the same thing(s) apply to twin-rotor helos, such as the Boeing / Vertol CH-47 Chinook and its variants? Thanks to all & have a great week! One question, though. Do(es) the same thing(s) apply to twin-rotor helos, such as the Boeing / Vertol CH-47 Chinook and its variants? Helicopters with wheels will generally ground taxi on the wheels. If you're asking about an height-velocity envelope, yes, but the Vertol and Chinook have the advantage of having two engines and two rotors and a bit more margin for a transition. The type of rotor system, and the area of the rotor disc, and the blade inertial makes a difference; in a helicopter with a heavy, wide rotor like a UH-1, there's all kinds of rotor inertia and capability to pull collective and save the day. In a helicopter like an R22, there's no rotor inertia, to speak of, and pulling collective at the wrong time will cause a rapid RPM droop, and loss of lift, and will take much longer to recover, if recovery is possible at all (depends how far into a corner someone has painted themself). I would also imagine operating like a pseudo plane makes operations easier with fixed wing aircraft. If everyone behaves like a plane in the airport then there's only one set of rules and behaviour to remember. Sure it might look a bit silly. But what you lose in sexiness you gain in operational simplicity and safety. Of course it'd be an airport by airport decision. Likely with exceptions for life and safety critical operations like police and ambulance. Except where absolutely-necessary (i.e. you're doing logging work), a helicopter pilot wants to hover in ground effect and depart by developing forward speed before climbing. At an airport, developing translational lift by running straight down the runway within a couple of feet of the ground and then climbing puts you in the best situation in an engine failure. At many controlled airports, they'll let you depart from midfield, and you can simulate the same effect over the grass. Climbing straight up is possible with a light-enough load, but it's stupid as you are operating the helicopter in a high-performance situation, and there are going to be points in the climb that if the engine quits, you're gonna break a bunch of stuff and have to do a bunch of paperwork if you live. AAIB report - "the tail rotor actuator control shaft (which controls the pitch of the tail rotor blades) becoming disconnected from the actuator lever mechanism"
The further cause of the failure under investigation but there was crud in and damage to an important bearing. 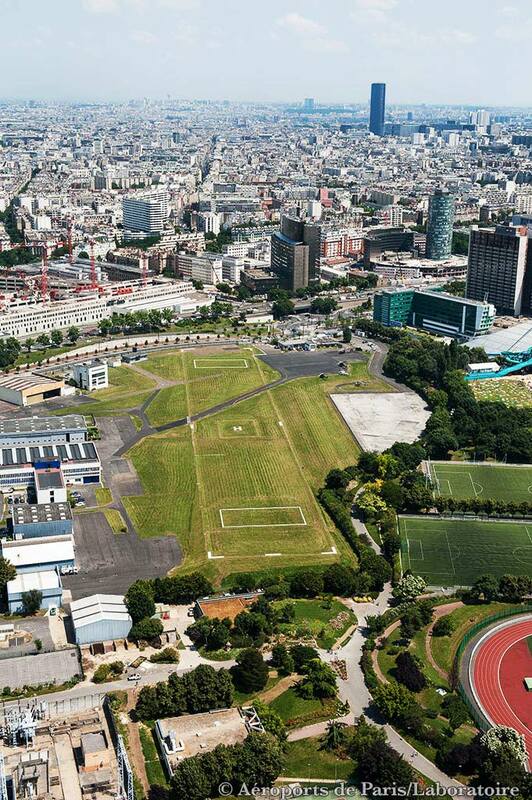 I always wondered the same thing as I frequently pass by JDP (Héliport de Paris) and didn’t understand the need for a 350m runway there. Thanks for the explanations. Thanks! Very interesting. So it seems possible that the takeoff profile might have made a difference in survivability and the high power setting might have led to some of the destruction of the innards of the mechanism. But probably once that linkage broke they lost the ability to control antitorque. Absent significant forward speed, the loss of antitorque causes a spin, which it doesn't do above a certain forward speed. Interesting summary; one thing jumped out at me: There is no such thing as an "uncontrollable spin". You end the spin by chopping the power. The spin stops instantly. But then you're left with no engine and if you're on the wrong side of the deadman's curve, it's gonna hurt. But the right response is: cut power, bottom collective, nose over to gain forward speed and, in this case, likely an almost-immediate transition to a flare at treetop height, and bleed off the kinetic energy as you approach the ground by smoothly raising the collective. Logging pilots end up being forced to do this on a regular basis (and for them you add, "Drop the load"). But like I said in the previous post, they probably were spinning pretty well before they even realized what was happening, chances are they weren't mentally-primed to respond to this, and there is a human unwillingness to cut the power when you see how close the ground is. Most pilot training programs no longer do autorotations to the ground, and most only demonstrate a tail rotor failure in hover without making the student practice responding to it, a "student safety" development that I disagree with. I don't know the background of the boyfriend/girlfriend pilot team in that helicopter, so I won't jump to conclusions as to their readiness for a situation like this, but I will be interested to see what the AAIB finally concludes, if it does, whether pilots with different training/experience might have been able to get a better result. Same with a different takeoff profile. Hamburgs "Uni Eppendorf" hospital ( a rooftop pad ). height above the pad. Then go into forward flight. As long as a helo can hover it’s guaranteed to fly. There are no guarantees if a helo is unable to hover. When we launched sorties into Iraq from an amphibious assault ship, they had loaded the helos to a point they were unable to hover in ground effect. When the helos got to the forward deck edge they just rolled off the edge of the deck and fell off the ship, disappearing below the height of the flight deck finally reappearing a few seconds later clawing their way into the air. Pretty much the same way I get out of bed. This has to be one of the more informative threads I've read through in quite some time. Thanks everyone for your excellent replies! No one has mentioned down wash from the blades? Might be an issue on the apron, no? Is this a documented procedure? What I mean is, did someone make rules (wind over deck, max gross weight) and practice this type of thing? Was this the first time the pilots had tried this procedure? Had you ever done this is peacetime? were being used there ? It all makes sense. I guess even though we were going forward at the heliport north of Kona it seemed like “straight up” to a passenger. My only other experience as a pax was way back as a kid in a Pan Am helicopter that went EWR-Wall Street-JFK and I don’t remember landing on a runway off Wall Street. Of course those birds had wheeled gear, not skids. The LA county sheriffs don’t have a runway off I210 either. Just a small landing area behind Jack in the Box. And the numerous helipads around LA don’t have any way to taxi or fly forward along a flat surface. So the question I guess is reversed: if the Hawaii way is safer, is the SoCal setup where so many helicopters launch and land at small pads less safe? Yes, but that's the compromise of a confined space. It was discussed. Read the thread. These were CH-46 helos. I got the impression 46s were always flying around at their limit compared to say the -53Es and UH-1s. I think the -46s have all transitioned to the Ospreys now. Though I could be wrong. although I had never seen the -46s do deck launches during the MEU workups prior to deployment, I imagine the procedure is covered under the aircraft NATOPs. The ship operates under the CV NATOPs which provide wind and sea state operating limitations and requirements for operating aircraft and deck launches in general is covered as a procedure. There are war reserve bulletins for each aircraft type and these bulletins allow pushing the performance of aircraft above peacetime limits. I personally wasn’t involved with any performance calculations but I imagine (I would hope) that the Air Boss was involved in discussions with the embarked squadron with what they needed the ship to do in order for them to accomplish their mission. But in general (in the Navy and unlike civil aviation) when a situation occurs that isn’t covered under any published operating procedure provided by the Fleet, TYCOM or other authority, you write up an instruction for it, brief the CO and get the CO’s signature. That’s where the “if it’s not prohibited, it’s allowed. (At least until you fubar it up. )” comes from. Are there any videos of this that you're aware of? I would love to see this if possible. Never understood helicopters autorrotation! Airspeed is needed. Thanks! Saw helicopters do take off runs lots os times, even experienced it once in a very loaded Mi-8 over Shimla. You can't hover a loaded helicopter without airspeed. It's no day without learning something! This is a question I've wondered about for years. I guess I could have done a quick search but I never seem to think of it when I'm at the computer. I have flown on a few helicopters in my life, but this was my first experience with 'hover taxiing'. I experienced this a decade or so ago when working offshore in Qatar. They primarily used Bell 412's as passenger buses to the offshore rigs. 2 pilots, 13 passengers, (each with a bag for their 2-4 week stay on the rig), random goods, (I took an A/C unit out on one trip), and probably a full load of fuel. It makes sense that these copters would be at, or close to, MTOW. Add to that a density altitude that can be over 3000' in the summer. These aircraft are operating at the edges of their performance envelope. The 'running start' takeoff to increase lift and energy with forward flight, makes a lot of sense. Here are the coordinates of Doha's helipad. You can see the dozen or so helicopter parking pads and the taxiway to what used to be main runway at DOH. Here's a guy who makes an autorotation look very easy, and in training his student has the balls to go all the way to the ground. I firmly believe that if you practice it like that over and over, all the way to the ground, when the crap hits the fan you won't botch it like many, many professional pilots do. And if you're not afraid of the autorotation, you're not gonna be afraid to cut the power in a loss of antitorque effectiveness. Every time I watch that video, I'm amused by the student trying to sound totally calm and knowledgeable and like it's no big deal when he is doubtless ready to pee himself. Afterwards, he chirps out "very good" and "I have the flight controls" in a slightly-higher-pitched voice, like what they just did was routine. It was no big deal for Will Wesson, and that's the point; it is quite surprising how many pilots screw this procedure up when they have to do it for real, which I chalk up to simply not having done it enough to have confidence in it, or never having done it all the way to the ground. Of course the Jet Ranger, like the Huey, has a massive rotor system that stores lots of kinetic energy. It's a very forgiving helicopter to autorotate. R22 is the other end of the spectrum in terms of kinetic energy storage. That was frickin' awesome. I thought both pilots were properly calm and competent. Nice auto. Is this a documented procedure? What I mean is, did someone make rules (wind over deck, max gross weight) and practice this type of thing? Robert Mason has an excellent description of an on-the-ground rather than on-the-water similar situation in Chickenhawk. It has an interesting ending when they come in to land and discover that that they have mistakenly aimed this too-heavy-to-hover helicopter at a landing spot that is in a minefield. (Hey, the guy was pointing over there. He just didn't mean that he wanted them to land on the other side of that fence.) Fortunately, they burned a bunch of fuel on the way over to the destination, thereby shedding weight, but getting out of the minefield and over the fence is an interesting tale. Having something to dive down into, like a deep valley, can be a real saving grace (although going off the deck is certainly interesting as it's not all that far to the water). But if it's enough, it's enough. Nobody gave Mason any specs on how to do it. The army loaded up the helicopter and told the crew to take the stuff from here to there and that's what they did. As another poster pointed out, wartime is different. If you fly helicopters or just like them, Chickenhawk is an indispensible read. Its description of training is dead-on, but the war stories that follow are so memorable that I recall tiny details even though I haven't reread the book in years. I should probably go and see if I can find my copy now that I'm thinking of that heavy-helicopter story. Thanks for that. You are right. The student was certainly outwardly calm, although I still think I hear something in his voice. Maybe I was just projecting my own efforts to appear cool despite the tightened privates the first time an instructor cut the power on me as a surprise and told me to take it all the way to the ground. "Reacher" was the crew chief of a particular Huey. He had made some subtle adjustments of the turbine that increased power. In the Cav, ships were assigned to a particular crew chief/mechanic, but pilots flew the ship they were told to fly and this changed essentially-daily; they didn't have their "own" ship the way the crew chief did. Mason said that others told him that the adjustments shouldn't have worked but they did. That's what he's referring to as "Reacher's illegal tune-up". The other character, "Leese", was Mason's guru, a pilot who had flown gliders in WW2 and lived, and was now an experienced Army helicopter pilot and a guy that Mason loved to fly with. Leese was always calm, and filled with wisdom. That's got to be scary the first few times a pilot does that maneuver. Wow... Nerves of steel. I enjoyed this thread and learned a lot.. Thanks guys! Great view, thanks! It's seems to be going down quite fast, but then it has energy enough to do a "flare". Result: Helicopter ready to fly again next morning! It is indeed coming down fast. But a lot less fast than if you don't immediately bottom the collective if the engine quits. Then the blades will stop spinning and it's just going to fall at 32 ft/sec/sec. If you just sit there and let it hit at the descent rate that you see in the video, things are going to break, including the humans inside. Interestingly, it doesn't actually feel dangerous as you're coming down. The bleed-off of forward speed in the flare kind of buoys the helicopter like a weak parachute, and then you use the kinetic energy in the rotor system to cushion the landing. That's why you have a minimum forward speed component; that's a memory item as is the maximum-distance engine out forward speed for that model helicopter. As with all things in a helicopter, it's a coordinated ballet of simultaneous inputs that a great pilot like William Wesson in the video does effortlessly. It's easy to screw up if you overthink it, which is why practice and experience is so important to being able to do it correctly when it's no joke. If you have lots of altitude (don’t know how much you’d need) you don’t immediately bottom the collective and the rotor slows or even stops, if you then lower the collective could you get the rotor spinning again, regaining the energy for an autorotation and flare ? You're not going to stop the rotor, but if you don't maintain RPM, you have no control and you're a tumbling object in free fall. To autorotate, the rotor disc must be oriented perpendicular to the relative wind, which in autorotation is from below the helicopter (and just in front). An airplane has a wing that's there all the time; and to recover lift in an excessive angle of attack, one simply decreases angle of attack. In a helicopter, the "wing" exists as a rotor disc area, and it exists because the rotor is in motion. Slow the rotor too much or stop it (were that possible), and the wing would cease to exist: no more rotor disc. Bottoming the collective is to ensure the transition of airflow from above the rotor to from beneath the rotor, with minimal decay of RPM and thus rotor energy. Lose rotor energy, and you may not get it back; the result is a rapid increase in descent rate, and as a rule, helicopters don't cruise at high altitude. Whale is correct. The way I would say it is that if the main rotor RPM drops too much, you're gonna lose control of the helicopter with minimal or no ability to get it back, so that's really the answer. Whether they would slow to the point of stopping before you otherwise lose control of the helicopter is really irrelevant. Not bottoming collective = Bad Day. But don't assume that I have the slightest idea what I'm talking about. Now that I found my copy of Chickenhawk, let me find what Robert Mason says. Here: "In flight, you immediately pushed the collective down to neutralize the pitch angle. With the pitch flat, the rotors would continue spinning, providing lift, as the helicopter descended. If you held the collective in flying position, the blades would slow and stop. Because the rotor blades were rigid only by virtue of the centrifugal force of their spinning, the stopped blades would simply fold up and the helicopter would fall like a streamlined anvil." Mason, R., Chickenhawk, Penguin, New York, 1983. I always remembered that "steamlined anvil" line. He also says, "It was fatal not to push the collective down." This is why it is drilled into your head over and over, "Bottom the collective." If the rotor RPM starts to push out of the upper end of the green arc, you can pull a little collective to bring it back in, but the default position is full-down. I saw a cautionary video of the dangers of not immediately bottoming out the collective when the engine quits. A low time pilot was on, I believe, a solo training flight in a Robinson. The video clearly shows his main rotor stop turning, and the blades fold straight up as the helicopter plummets from hundreds of feet in the air. It was disturbing and unforgettable. I'm a private pilot, not a helicopter pilot, but that was a lesson I'll never forget. A stupid question from someone who doesn't know much about the helicopters: how does a helo with wheels taxi? When on ground, the rotor axis is strictly vertical, right? So what does create the forward moment? Okay, so the rotor can tilt independently of the fuselage? Then why does the helicopter need to adopt a nose down attitude to move forward when in flight? rather hard on rigid hubs slightly more giving with traditional hub arrangements. ( where is the limit with the "balanced" thingy the Robinsons have? It doesn't. That's the fuselage following the disk. The disk is the thing that flies. As it does, the fuselage comes along for the ride. Which direction the nose is pointing is entirely-independent of which direction the disk is flying. The rotors are mounted on the mast in a way that allows them to move up and down to a degree, but not completely. They are also mounted so that the pitch of any individual blade can be changed, either essentially-independently of the other blades (by the cyclic) or collectively (by the collective pitch control). As each rotor blade goes around, it's position from feathered to maximum pitch changes. If you push the cyclic in any direction, the amount of pitch of the blade on one half of the circle will increase and on the other half will decrease; the magnitude of the difference depends on how far you push the cyclic in any direction; that imbalance in lift tilts the rotor disk so that it moves lower in the direction you push the cyclic (and how much lower depends on how far you push the cyclic) and higher 180 degrees from that direction. To do that, because of the way gyroscopes work, you actually apply the force 90 degrees before the point at which you want the effect to be felt, for what it's worth. So in an American helicopter, whose blades turn to the left by convention, you apply the force 90 degrees to the right of where you want the effect to be felt. So as any individual blade goes around, it will be increasing pitch to reach its maximum at that point and decreasing pitch to reach its minimum pitch 180 degrees from that point. But that 90-degrees thing is a design issue, not a piloting issue. You push the stick forward, a downward force is applied 90 degrees to the right of forward, and the disk tilts in the direction that you pushed the stick, which is forward. The answer to your question is illustrated by what happens if you push the stick to the right. The disk tilts right, and the helicopter follows along. I can fly to the right -- even pretty darn fast to the right -- with the nose pointed straight ahead, because I am keeping the nose pointed forward with the pedals, which control the pitch of the blades on the tail rotor. If I want to keep the nose pointed straight ahead, I apply enough left pedal to counteract the amount of torque that is trying to spin the nose to the right. (The rotors are turning left, and Newton's Third Law applies, so nose wants to go to the right.) To counteract that, the tail rotor pushes to the right, so that the nose is pushed left. Less tail rotor pitch, nose moves right; more tail rotor pitch, nose moves left. So, I can use the cyclic to tilt the disk to my right, and have the rotor disk start moving to the right. I can accelerate my speed to the right, and keep accelerating to the right, by tilting the disk well to the right with the cyclic. The fuselage follows in that direction, but pointed straight ahead because of how I am manipulating the tail rotor with the pedals. But now if I want the helicopter to be "nose down" in that direction, if I want the nose to be pointing in the direction that I am going, I just give it a little right pedal for a second, and now I'm pointing in that direction. The rotor disk has been flying in that direction the whole time, but I have changed the direction that I myself am pointing by changing the direction that the nose is pointing. If I want to fly tail-first in that direction ("tail down" in your example), I can give it right or left pedal (right requires less energy) to spin me around so that now the tail is following in the direction of the rotor disk. I am holding the cyclic relatively-neutral because the disk is in the position I want it, and I'm just manipulating the position of the nose relative to the flying disk by using the pedals. PS Advanced users may realize and think to comment that in a helicopter, you're never actually operating any of the controls independent of the others. More left pedal, you're gonna need more throttle, which either you're gonna apply (in a piston helicopter) or the control system will apply (in a turbine helicopter), to keep the rotor speed constant. More right pedal, less throttle. Tilt the rotor disk from a hover and start moving in any direction, you're gonna need a little more collective to maintain height as you start moving, then a little less when you develop translational lift, unless you want to climb. Everything you do affects everything else you are doing, and you need to make subtle changes to compensate. Pull more collective -- which means more throttle to keep the rotor speed constant, putting more power into the rotor system -- and you're gonna need to apply more left pedal to counteract the additional torque in the system, or you will start to spin to the right. Which is why people find it so hard to hover the first time, and why pilots practice using one control at the time, with the instructor pilot manipulating the other controls, compensating for what the student is doing with the student's one control. Then when the student first gets to manipulate all the controls at once, he will be climbing, falling, moving to the left and then the right, pointing in one direction and then the other. Holding a helicopter over one spot, at 3 feet, pointing in a particular direction, involves a lot of subtle little corrections that you learn to make instinctively, but until you do it's funny to watch. Thank you VERY much wjcandee! As we say in France, "I will go to bed less stupid tonight". The answer to your question is illustrated by what happens if you push the stick to the right. The disk tilts right, and the helicopter follows along. I can fly to the right -- even pretty darn fast to the right -- with the nose pointed straight ahead, because I am keeping the nose pointed forward with the pedals, which control the pitch of the blades on the tail rotor. When you do that (flying to the right with the nose still pointing forward) will the fuselage get a bit of a bank angle to the right? Or it will stay level?